ArtTrader Magazine: Guerrilla Screen Printing! Once upon a time, there was a princess with a dream. She dreamed of wearing nothing but custom T-shirts, constantly adorned with odd designs and sarcastic proclamations. In order to make this dream come true, our fair princess priced a complete screen printing setup and nearly fell into a 50-year swoon at the price. It was pretty steep, even on a princess’s salary. She went through a period of making stencils for her shirts with freezer paper and an X-Acto knife and ended up with awesome shirts, with a side of carpal tunnel. Finally, she made a wish on a magic frog (or maybe Google), learned of Mod Podge screen printing, and lived happily ever after. Okay, maybe that princess was me, and, even though I don’t have a princess’s salary and can only be considered vaguely like a princess because “Sarah” MEANS princess, I really did feel a burning need to find a way to make cool shirts without aggravating my arthritis. The ability to make more than one shirt with the same design would be an added bonus. 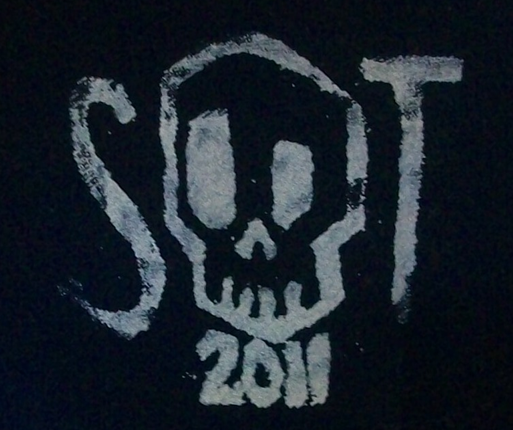 There are tutorials all over the internet for screen printing with Mod Podge, but I find that it gets a little goopy when you rinse the paint out of the screen. It dries fine and holds up to repeated usage, but the goopiness makes me nervous. Finally, I decided to try it with gel medium, and it worked amazingly well, so that’s what we’re doing here! Step 1: First, put your fabric into your embroidery hoop and pull it tight. SUPER tight. Tight enough that the members of Rusted Root could use it for an impromptu drum circle. Trim off any excess fabric, leaving about an inch remaining. You’ll note I have way less than an inch in all of my example pictures. That was a really bad move on my part! The sheers are slippery and will need to be pulled tight, so you’ve got to have a little bit to grab onto. Step 2 (right): Next you should draw or print a design. In image 1 (left), I have a digitally-designed eyeball printed out, and I drew a design that I plan on using on the backs of my canvases. 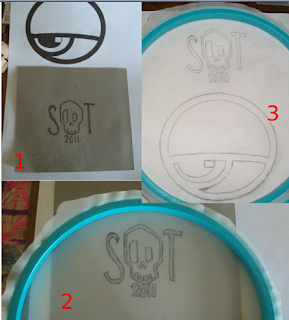 Lay your hoop fabric-side-down over your design (as in image 2, bottom) and trace with pencil. 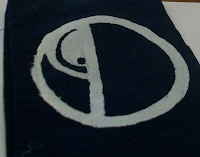 Image 3 (right) shows both of my designs traced out on the screen. Remember that you’re hand painting this, so super-detailed designs will be very time consuming and fiddly. Try to keep it simple! 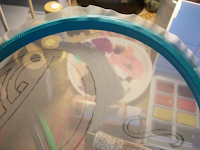 Step 3 (right): Now using gel medium, start filling in all of the areas where you DON’T want paint. The gel medium will act as a resist, like a bouncer at your favorite dive bar working tirelessly to keep the undesirables away. Work around your design until you think you have all areas filled in, taking the gel all the way to the edge. Lay it hoop-side-down and let it dry. Step 4: Now that it’s dry, come back and find yourself a nice sunny window or bright light and hold your screen up to it. Look for bright spots where the light is shining through (circled in the picture above) and fill those in with gel medium. Make sure your lines aren’t jagged and your details are all filled in. Step 5: Lay your screen fabric-side-down on a scrap piece of fabric or paper. Load your sponge brush up with screen printing ink or paint, hold your screen down firmly with one hand while you dab the paint on with the other. 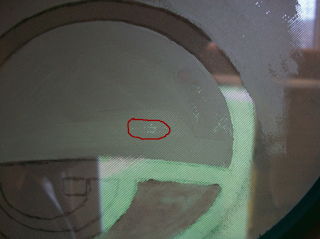 Be very careful to only use a firm up-and-down motion or you’ll get a sloppy print like my eyeball below. 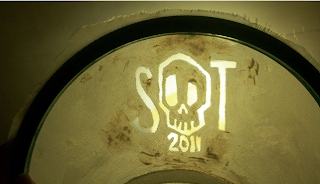 If you vary the pressure as you dab, you’ll get an awesomely worn-looking print like my skull below. Gently lift your screen and see what you’ve got! Now go put something awesome on all of your T-shirts, your surfboard, your refrigerator, and the side of your dog. Once you’re finished, rinse your screen really well in the shower or with the sink sprayer, and let it dry before reusing!